If you’re planning your volunteer appreciation strategy, it may make sense to step back and consider — What really motivates us? How can that be integrated into how we reward and recognize volunteers? Does recognition really require a big budget and lots of bling, or are we missing the point entirely? 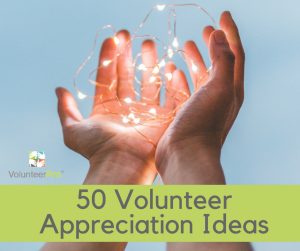 We share 50 ideas for recognizing volunteers. Values – a way to express ones altruistic and humanitarian values. Career – a way to improve career prospects. Social – a way to develop and strengthen social ties. Understanding – a way to gain knowledge, skills, and abilities. Protective Motives – a way of protecting the ego from the difficulties of life. Enhancement – a way to help the ego grow and develop. As a bonus, there’s also a section on how to write a meaningful thank you note. Enjoy! For author Daniel Pink, most businesses miss the point when they design their employee reward systems. In his TED talk “The Puzzle of Motivation” he explains what science has only recently discovered — contingent motivators don’t work. When we attempt to inspire using a transactional approach — “if you do X, we’ll give you X” — performance actually gets worse. Unfortunately, extrinsic motivators are still what most of the world relies on to reward employees (through pay for performance, for example) — as well as volunteers (through gifts and awards). “There’s a mismatch between what science knows and what business does,” explains Pink. Extrinsic rewards or incentives don’t increase productivity or motivate, he argues, because they actually make us focus on a limited action and consequence and thus restrict possibility. This is especially true when it comes to jobs that require cognitive skills over merely mechanical ones. Consider motivating the elusive “skilled,” pro-bono, or leader volunteer. Is it possible, we limit their potential by the way we recognize them? Science tells us that human motivations have changed over time. In today’s world, there are four main things that experts believe motivate us in the workplace, regardless of age or generational affiliation – autonomy, mastery relatedness, and purpose. They can be translated to the volunteer environment as well. During countless interviews and conversations with volunteers, we have heard similar themes expressed. Our supporters don’t really need to see a plaque, trophy, or fancy dinner to feel appreciated. They want to see and experience the change in the world they work so hard to bring about. Volunteers are driven to help organizations and communities, without pay, because they can bring about improvements in society and because they matter. So, rather than using outdated ideas about what motivates people, why not what science has discovered to improve your volunteer appreciation practices?